Our goal is to provide discounted building materials that are quality, 1st-run building materials at 30% – 70% less than the big box stores. We travel the country to obtain our materials, often through buy-outs and liquidations. These materials are brought back to central Pennsylvania and offered to our customers at deep discounts. The Journey that has been McCarren Supply represents the quintessential American success story. What started as an abstract idea, evolved into a 23,000 sq. ft. depot of surplus building materials from all over the United States. Through hard work and perseverance, McCarren Supply has become the go-to source for building materials for many central Pennsylvania residents. The year was 1997 and Steve McCarren was tired of his job after 25 years as a general contractor. A three-car garage in a back alley in Newville, Pennsylvania served as the backdrop for the birth of what is now McCarren Supply. Selling used kitchen cabinets and a small selection of windows and doors as a part-time hobby, Mr. McCarren nurtured and grew his business. In 1998 he graduated from the garage to a chicken shack (yes, an actual chicken shack) outside of Carlisle, PA. The larger space allowed a large inventory and the customer base continued to grow. The avenues from which the materials were coming also grew and Mr. McCarren realized he was really onto something. By early 2002 he had outgrown the chicken shack and also desired a more prominent location. The next move was within the borough limits of Carlisle into a leased space with other small businesses. One advantage to the new space, beyond the visibility factor, was the opportunity for expansion. Mr. McCarren started with 2,000 sq. ft., but soon expanded to over 10,000 sq. ft. within two years, including most of the subterranean basement. He also was able to hire additional employees and things continued on their upward trajectory. 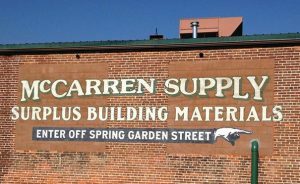 With the increased space came an increased rent payment each month and it became obvious that it was time to purchase his own building in which to house McCarren Supply. In 2003 Mr. McCarren purchased an old ribbon mill and moved his business to its current location. The old factory, which had been vacant for several years, offered plenty of space as well as the option to expand further. The dilapidated building was slowly renovated and additional commercial space was leased to other businesses. 15 years later McCarren Supply has up to 20 full-time employees as well as several part-time employees. Things have changed quite a bit from the days of the chicken shack, but one constant has remained… great products at even better prices. Come to visit us today and see what you have been missing.